Improve your toddler’s hand-eye coordination and logical skills with ‘More Puzzle Practice’! Free and printable, this toddler activity is easy and fun to do. Just print out the activity sheet and follow the instructions provided to improve your toddler’s attention span and concentration skills. 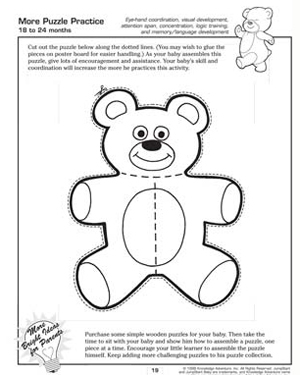 With a cute teddy bear to piece together, the toddlers are sure to enjoy this activity!